Just over 16 months ago, I typed "rowing+Hartford" into Google and stumbled upon a small rowing organization based on the Connecticut River. It began a journey that literally has changed my life. To be fair, I'd been interested in the sport for quite some time. I attended the University of Virginia, where I played volleyball and softball. I'm 6 feet tall and broad-shouldered, so it was no surprise that the women's rowing coach was always giving me a hard time. He suggested I should "quit playing around in the dirt and come try the water." In hindsight, maybe I should have listened. 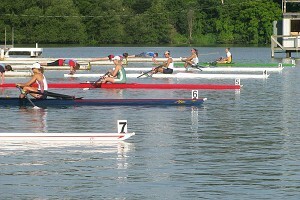 Countless hours on the water helped Meghan O'Leary, in boat 4, to her first rowing victories at the Royal Canadian Henley Regatta. I was immediately hooked -- by November I had committed to training at the elite level. Five months later, I competed in my first U.S. Rowing National Selection Regatta (NSR), finishing nearly last in the time trials -- 31st out of 33 of the best scullers in the country. It was my first 2,000 meter race. I also hoped it would be my ugliest. The next several months were filled with countless hours on the water and in the weight room, and thousands of miles driving across the country with my boat strapped to the top of my Toyota 4Runner, traveling from regatta to regatta and staying in questionable motels along the way. But I was gathering the racing experience that I so badly needed, and eventually a few wins along the way, including two at the 129th Royal Canadian Henley Regatta in the women's senior double and quad sculls. From Princeton to Philadelphia, Indianapolis to Canada, and from 31st to first, it was a busy summer. At the end of September, I was invited to participate in a National Team Evaluation Camp, where, if I performed well, I could be invited to train at the National Team Training Center in Princeton. I spent all of September preparing for the camp, and I needed that prep time: the week consisted of rigorous two-a-day workouts -- both erg testing (on a rowing machine), and rowing in the water. Going into my evaluation at the end of the week, I was merely expecting a "good job, keep up the progress you're making." Instead, I got a bid -- and moved to Princeton a month later. Now, I wake up at 5 a.m. every day to complete the first of two -- sometimes three or even four -- workouts, fueled by my new passion and goal, to make the National Team and compete in the Olympics. It blows me away to think that just over a year ago I picked up my first oar. Undoubtedly, it will be a long road ahead to get to where I'm going, but I couldn't be more excited about the trip thus far. There are no easy days, only days that aren't quite as hard as others. I carry with me something a friend said to me after my first NSR and it has stuck with me since: "Go longer than most people think is reasonable, and you'll be the one standing at the end." Meghan will be blogging for espnW throughout her training leading up to the Olympics in London next summer. Check back every two weeks to follow her journey. Meghan O'Leary first picked up an oar 18 months ago, but quickly realized she had immense talent in the sport. The former volleyball and softball star at Virginia is now training at the U.S.O.T.C, hoping to make the London Olympic team.